Your plan determines how many admins you can have on your account. Admins have access to the Admin Center and can view all account and member data. 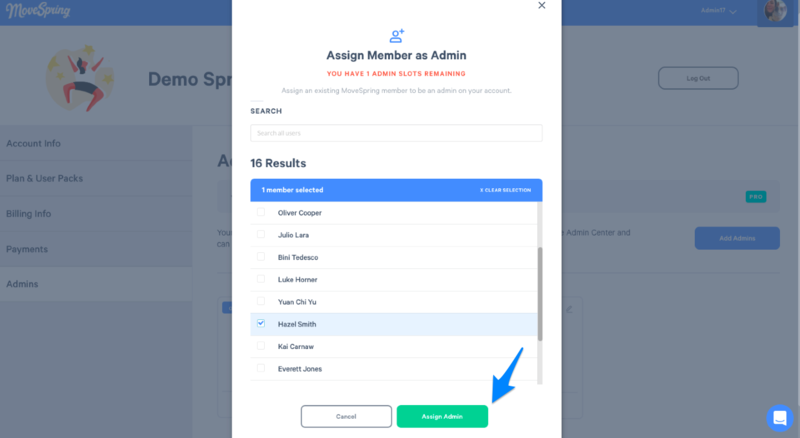 You can view your allotted number of admin accounts in your Admin Center settings. If the incorrect number is displayed please reach out to customer support or your dedicated client success rep. This article outlines how account owners can add new admins to your account. Reminder, all users who wish to be admins must first create their user account underneath your client to be given admin access. Log into your Admin Center. Go to your Account Settings from the Profile drop-down. 3. Scroll down to select the Admin tab along the left-hand side. Reminder, any user who wishes to be granted admin access must have first created their user account by following directions to create an account under your customized client. 4. Select the Add Admins button. 5. Search from your current users and select the box next to their account.